In the era we’ve officially dubbed as the digital age, companies are constantly working to create and invent new and improved technology. They make phones and handheld devices that have faster processors, take better pictures, and all-around work better. They develop software updates and programs that exceed any that have come before. And although these developments are often exciting and, for the most part, offer considerable progress, they have a tendency to make the technology you already own feel obsolete. Unfortunately for us, technology is a pricey investment no matter what device you’re talking about. That being said, very few people can afford to buy every new model that hits the market. So, how do you stay updated without spending a fortune? 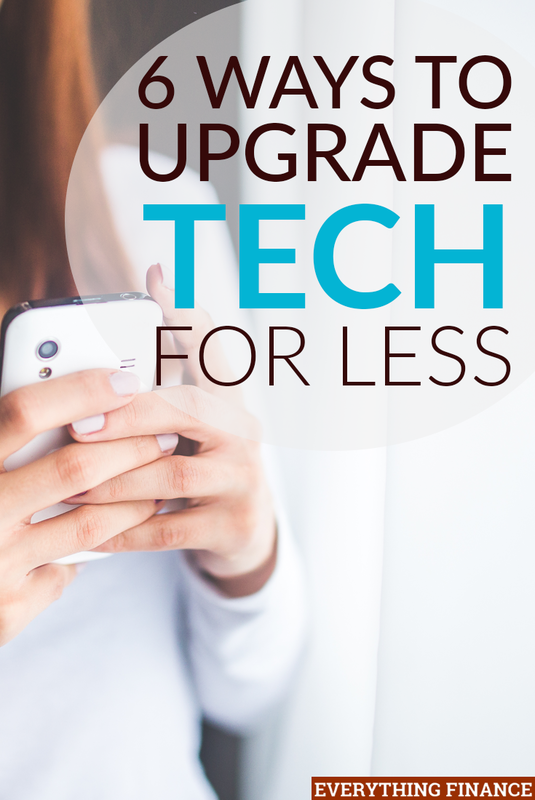 Here are 6 ways you can upgrade your technology for less. One of the best ways to upgrade your technology is to update its software. Although it can sometimes seem like a hassle, new software can often fix glitches, make your system run quicker, and sometimes add new features to your existing device. Most companies, like Apple and Android, release new operating systems at least once a year and in most cases, since you already own the device, you can update your technology at no cost. The same is true for the operating systems on your computers. All you have to do is search the Mac App Store or click your Windows icon to gain access to the latest and greatest software to upgrade your computer for free. Just be careful to make sure you have enough time to complete the upgrade as they can sometimes take a couple of hours to download and install. In addition to installing new software on your computer, you can also significantly enhance your web browser. Whether you’re using Google Chrome, FireFox, or Safari, most web browsers allow you to download extensions for free or little cost. Browser extensions allow you to do an array of different things when searching the web. From saving articles to read later, to searching inventory on Amazon, to screen-shotting your whole monitor, or looking up words in the dictionary, adding a few simple extensions to your browser can instantly update your technology and make it easier for you to do the tasks you do everyday. Let’s face it, as much as you’d like to buy a new car every couple of years, you most likely hold on to yours for at least six or seven. Unfortunately, like the rest of the digital world, automobile companies are constantly adding new technology to every model they churn out. This inevitably means that your navigation and entertainment systems, or sometimes even your starter, become outdated rather quickly. Thankfully, you can still upgrade your car without investing in a new one. One quick and not-too-expensive update you can make is to install a keyless automatic starter. It’s convenient when your car is already cooled on hot days or toasty on winter evenings before you even step foot inside it. Another easily replaceable piece to your car is the radio or entertainment system. You can swap out that old stereo for a new in-dash system that features audio, entertainment, and even navigation. You can also add a back-up camera or a Bluetooth system to your car. Before you know it, you’ll have all the features of a brand new car at a fraction of the price it would cost you to purchase or lease a new one. With the release of the iPhone 6 came Apple Pay, which gave millions around the world the ability to make mobile payments without ever taking out their wallets. And although this is handy, it’s only available on the new models. What if you’re stuck with something else? With a system like LoopPay, Android Pay, or Google Wallet (or Samsung Pay, if you have a Galaxy phone), you can use any smartphone to electronically pay at any store that has a card pin pad you’d normally use to swipe your card. These apps let you digitize your credit and debit cards and allows you to imitate a card swipe without ever taking out your actual card. It’s a quick way to update your phone with just an app. Most computers, and yes even Apples, have a tendency to become slower and faultier over time, especially if you use them a lot during the day and very rarely shut them down. An inexpensive fix to upgrade your computer is to wipe your hard drive and reinstall everything as if your computer was brand new. All you need is an external hard drive to back up your files so you don’t lose anything important. Once you’ve done that and cleared your hard drive, you’ll probably find that your computer runs much faster. Another option, while you’re messing with your hard drives anyway, is to replace your internal one as well. Even if you haven’t used up your capacity, hard drives get old and become slower over the years. Replacing your internal drive can improve your computer’s performance by causing your system to read and write data much quicker. This upgrade is a budget-friendly way to make sure your computer lasts as long as possible. If you have a laptop, double check to make sure you can access the hard drive before trying to take it apart. For example, some Macbook Air models aren’t built to be upgraded. If looks are the driving force behind wanting to upgrade your technology, there are some cheaper alternatives to that as well. Although your handheld devices are more difficult to do this with, a quick change of covers or cases can refresh your phones and tablets more than you realize. When it comes to desktops, however, you actually have a few options. You can purchase a newer monitor that’s bigger or sleeker, or a new wireless keyboard or mouse. Although your computer itself won’t change, your viewing power will and the wireless keyboard and mouse are instant digital-age upgrades. When you’re on your phone or computer 24/7, it makes sense that you’d want to upgrade your technology on a regular basis. Of course, for those on a budget, that isn’t always feasible. Thankfully, by simply adjusting your software or adding some simple upgrades, you can improve your existing technology and make it good as new without spending a fortune. How often do you upgrade your technology? Do you try and find the best deals before doing so? Which Baby Essential Costs Can You Skip?